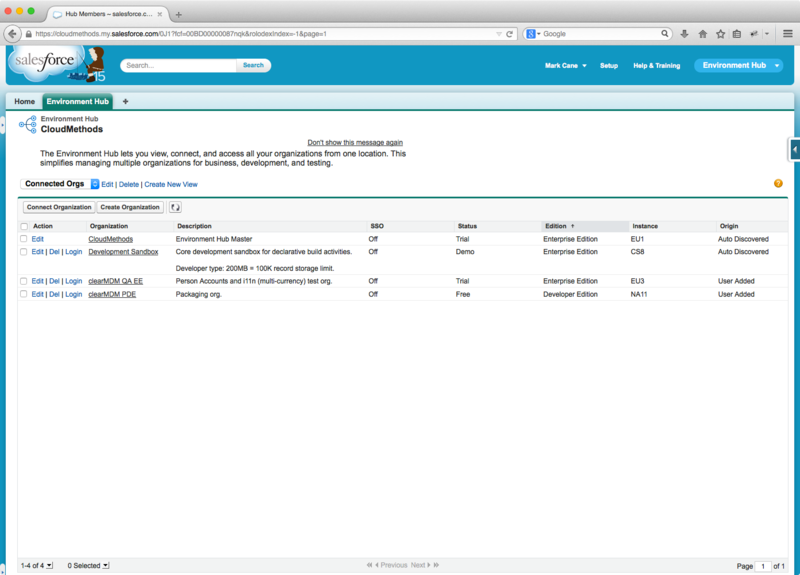 Environment Hub was announced back in August 2012 and was initially made available as a Pilot feature of the Winter ’13 release. This post follows up (some 2 years later) on my initial interest in understanding the utility Environment Hub delivers in the context of environment/user management. Environment Hub – What is it? 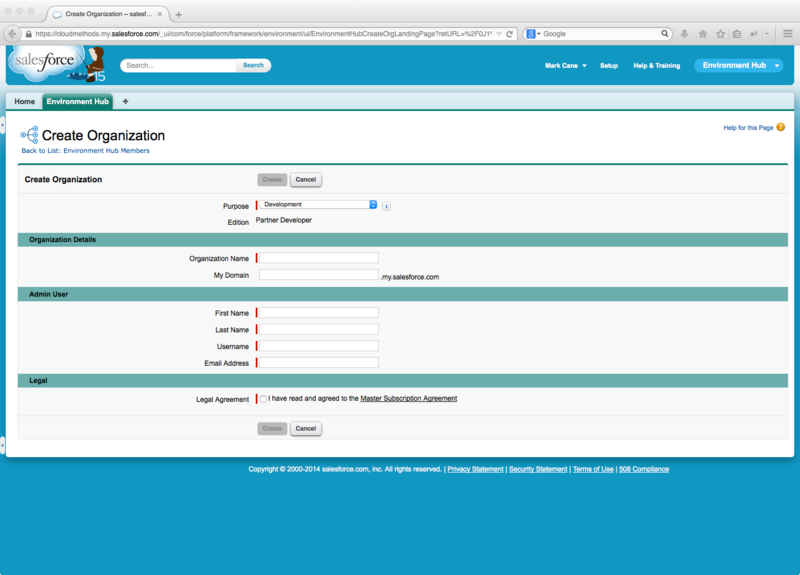 In simple terms Environment Hub is an org administration tool that enables multiple orgs (of any type) to be associated and accessed from a central location. Each connected org is a termed a Hub Member, with an imposed constraint that each Hub Member org can only be parented by one Hub org. It is therefore imperative that Hub Members are only added where there is no contention over the appropriateness of the parent Hub. Commonality of target production org or packaging org is a good starting point for this consideration, as is the rule that client orgs should never be parented by an ISV or Consultancy Hub org. The parent Hub org should always be the most-accessed org, the credentials for which will become those by which all org access is made. For larger programmes of work Environment Hub provides a highly useful means to catalogue the org estate and to provide SSO between the constituent orgs. This latter point enables reduced password maintenance, simplified access and centralised user administration in terms of deactivating a user account in one place only and ability to view login history in once place. 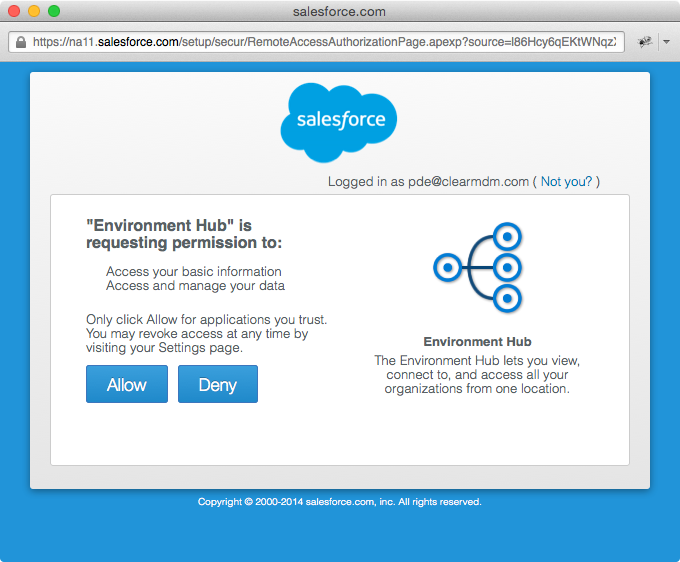 Environment Hub is enabled by Salesforce support who will require confirmation to proceed with the change. From experience, the enablement process can take a few days. 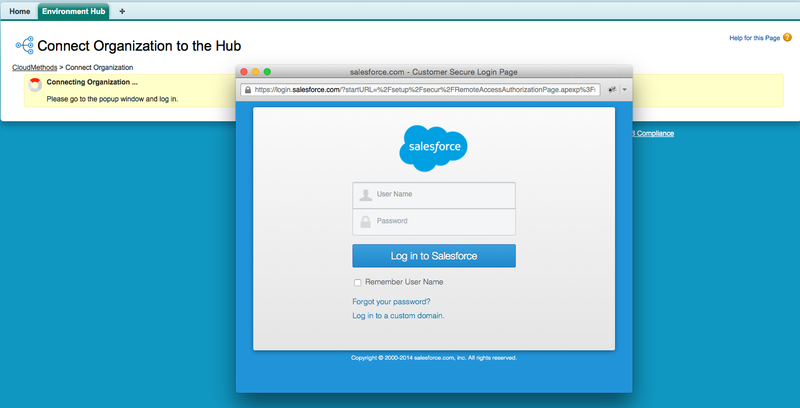 Connecting Hub Members to the Environment Hub occurs via the entry of an administrator username for the target org and subsequent OAuth authentication and authorisation flow. The User Permission “Connect Organisation to Environment Hub” is required. Once an org is connected to the Environment Hub interesting detail such as the Edition, Org Status and Org Expiry date is revealed. It is also possible to add custom name and description attributes to the Hub Member, which I really like, each org in the estate should be justifiable and have a specific purpose – here we can capture this plus accountable contact etc. A very useful means of cataloguing and tracking the org estate. 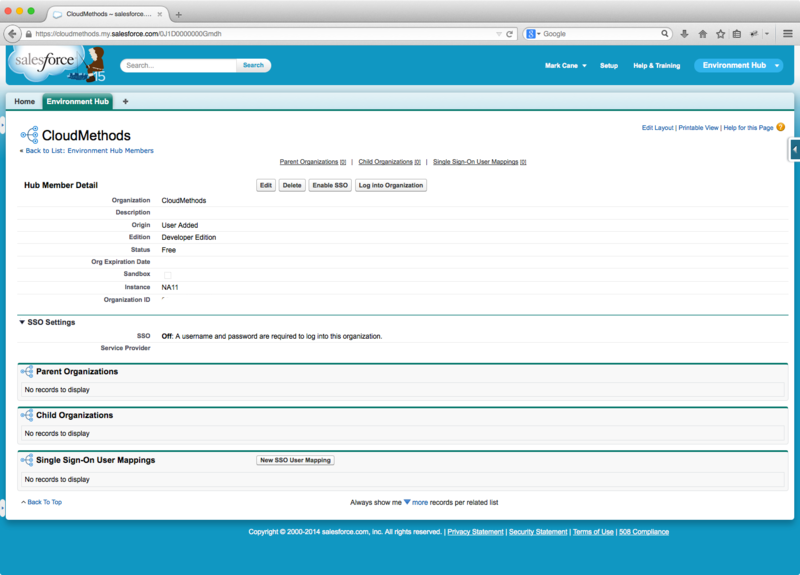 The Company Detail page in the connected org will now show the Environment Hub Org Id value as below. In addition to the “User Added” origin, Hub Members are also auto-discovered using existing org-to-org relationships as below. 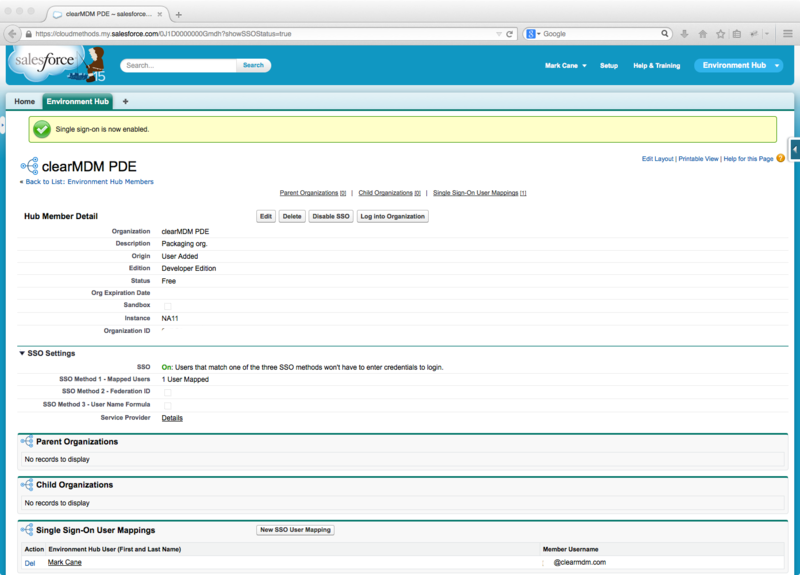 New development/test/demo orgs can be created directly within the Environment Hub – this replaces the functionality previously exposed via the Salesforce Partner Portal, for partners at least. I’m unclear how the types of org offered are affected by partnership status etc. or perhaps whether the Environment Hub itself is available only to partners. Test/Demo = Pick Edition for a 30 day time expired org. Useful information of the distinction between different org types can be found here. SSO can be enabled between each Hub Member and the Hub org; in implementation terms this means the Hub org is configured as an Identity Provider with a Service Provider being configured (automatically via the SSO enablement process) in both the Hub Member org and the Hub org. Both IdP initiated (via the Environment Hub tab) and SPI-initiated (via enablement of the Service Provider as a Login Page Authentication Service) SAML flows are supported. The latter point meaning SSO could be enforced as the only authentication means – thereby switching off standard Salesforce authentication entirely. 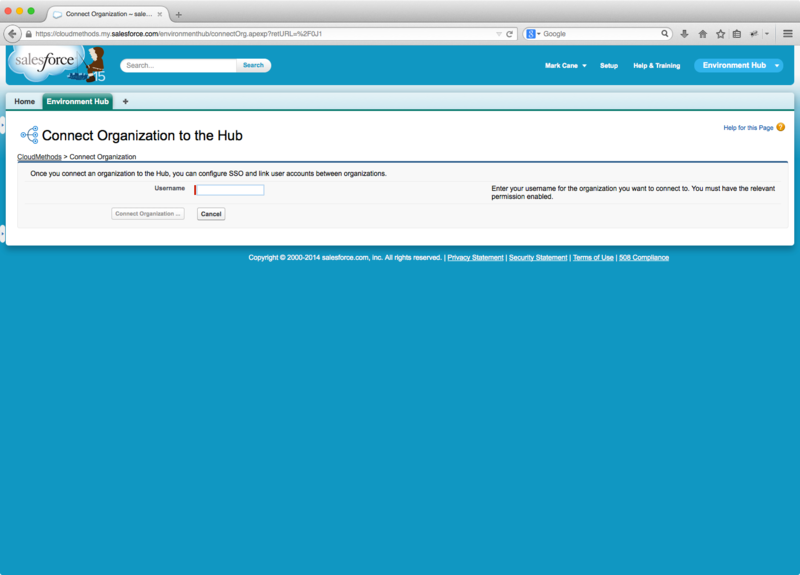 Each Hub Member Org must have a My Domain configured for SSO to function. Note, enabling SSO creates a Service Provider in the Hub org, default permissions are provided to the Standard User and System Administrator profiles only. It is therefore a requirement to ensure relevant permissions (Profile or Permission Set) are provided. Within the Identity Provider, the Hub Member specific Service Provider configuration is set with “Subject Type=User’s ID determined by Environment Hub”, this setting delegates the user mapping to the Environment Hub settings, defined as below. Method 1. Mapped Users – 1 to 1 mapping of user names – per-user. Method 2. Federation Id – boolean state, yes = attempt to map users on common Federation Identifier values. Method 3. User Name Formula – formula expression = attempt to map users via formula result. Where multiple mapping types are enabled the precedence order above applies. For SSO between a sandbox and production org, user mapping is implicit and not configured as above. Enabling Environment Hub adds the EnvironmentHubMember standard object which is open to the declarative build model; custom fields, page layouts. validation rules, workflow rules, approvals etc.. In addition Apex Triggers can be defined on this object, use cases for which may include notifications relating to status changes etc. A second standard object EnvironmentHubInvitation is also added, however this object is inaccessible from the Setup menu (although it can be reached via /p/setup/layout/LayoutFieldList?type=EnvironmentHubInvitation&setupid=EnvironmentHubInvitationFields). I’m assuming this object to be either forward looking or a legacy of an invitation-based connection model (as per Salesforce to Salesforce). Regardless, records do seem to be added to this object, the logic for which is unclear. For consulting projects Environment Hub offers significant value in terms of management and tracking of the org-estate and centralisation of user administration. In practice this would require all project contributors to access production (Hub) as the primary org and SSO into secondary (Hub Member) orgs as required. In this model, production could be utilised for project collaboration, bug-tracking, project management etc. which is a common approach. The obvious downside being the requirement to license the project team in production – a big challenge on many projects where user licenses aren’t provisioned until a late stage or business use runs parallel to project activity. In such examples, project contributors could be provisioned with low-end user licenses on a temporary basis. Ideally we could do this with a Chatter Plus license as users would only require Chatter, Custom Objects (10 or less) and Environment Hub access. For ISV projects, the utility of Environment Hub relates more specifically to the ability to catalogue the multitude of environments required for development, test, i11n, packing, release and patch purposes, not to mention TrialForce. Efficiency of access across this estate is also a key factor.